Please visit the website and give me feedback. It is a work in progress but I find I can provide more information by consolidating. Thanks to all the visitors. This blog will still be active but to see any current content please go to my other site. Growing up in Puerto Rico, I have fond memories of the holidays. Christmas, was just the beginning and we would receive one gift. The real holiday came on January 6, El Dia de los Reyes (Three Kings Day). I remember the day before and going in the fields with the other children in the neighborhood to gather grass. We would put the grass in a shoebox and leave it out for the camels. After waking up and receiving our presents our family would get in the car and visit relatives who live in the mountains for the real celebration. Lots of relatives, lots of children and the food, arroz con gandules, lechon, all made for an experience I still long for today. Unfortunately, times have changed and that tradition is being forgotten. Reading the article below brought back all these fond memories. An inspiring story that shows that you are never too old to make a difference. For the complete story follow the link below. Sad to hear about Eartha Kitt dying but she lead a very interesting life. She was most known to audiences as Catwoman in the Batman series from the 1960's. I just came across this very informative and comprehensive website for Latino culture and history in the United States. The site is run by the University of Houston and its publishing firm Arte Public Press. They break down the site into different components, information for teachers and students, authors and artists and for scholars and researchers. You can find free content as well as content that can be licensed for publication. They provide articles, chapters from their publications, music and art. It is a valuable resource for anyone wanting to know more about Latino culture and history or for anyone needing to do research for papers or publications. It's videos like this that warm the heart. A ten year old fan of the Broadway show "In the Heights" got more than he imagined when he wrote Lin-Manuel Miranda, the star and writer of the show asking to meet him backstage. Lin-Manuel orchestrated for the boy to perform the finale of the show in an after show performance. The boy had been posting videos on You Tube singing songs from the show. The look on Lin-Manuel as he watches the boy get his dream is priceless. You can head an interview with the boy and his mother as well as a video of Lin-Manuel speaking about the experience and how it came about at Broadway World. In this time of giving, I have chosen to support our children's education. There is a great site called Donors Choose, where teachers can post projects that they are trying to fund. You can see a link on the left column of this page. Most of the projects are very low cost, sometimes less than $100.00 can provide classroom supplies that should be a right for any student. Here in the U.S. education seems to be left behind when budget cuts are considered. It is a testament to the true heroes in our society, the teachers that commit themselves in spite of the lack of support. I have created a donors page that can be accessed through the link above. In here I have posted some projects that will be expiring soon and need very little money to complete. Please help in any way you can and be proud of the fact that you are doing some good in a child's life. In this holiday of Thanksgiving, let's not forget about others here in the U.S.A. and around the world dealing with AIDS. This is a song recorded by Annie Lennox to raise money for those suffering with AIDS in South Africa. Let's not forget those we have lost in our lives to this disease and let's do whatever we can to help the spread of it. You can click on the images for a larger view. 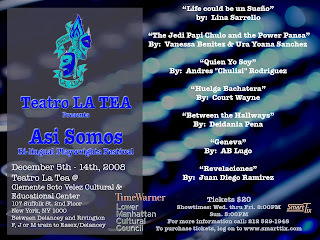 In the meantime, support Latino theater! Opening December 12 in wide release in the U.S. "Nothing Like the Holidays" boasts a great Latino cast. The movie stars Luis Guzman, John Leguizamo, Alfred Molina, Jay Hernandez and Freddy Rodriguez (who also produced the film) and directed by Alfredo de Villa (Washington Heights, Adrift in Manhattan). I am a Puerto Rican born on the island and raised in New York. I work for a cable network as a production manager.